In case you were wondering why it is so hard for regular working people to get ahead in our economy, look no further than today’s Harris v. Quinn Supreme Court decision. In the usual 5-4 pattern, the corporate-conservatives on the Supreme Court struck another blow against the rights of working people to organize and try to get ahead. Home care workers (mostly women) in Illinois (like elsewhere) were on their own, working long hours for very low pay. They were treated poorly and did not have any job security. So they organized and a majority voted to join a union, Service Employees International Union (SEIU) Health Care Illinois-Indiana (SEIU-HCII). The union then worked with the state of Illinois to forge a contract to deliver services to elderly and disabled state residents. Since they formed the union, they were able almost double their hourly wages and they get health insurance, regular professional training and representation from the union. An anti-union organization, the National Right to Work Legal Defense Foundation (NRTWLDF) – funded by the Koch and Walton families and others – brought filed the Harris v. Quinn suit against the union. This suit wound its way through the courts and finally the Supreme Court decided to rule on it. The Court decided that a contract between the state of Illinois and Medicaid-funded home care workers cannot require the covered workers to pay a “fair-share fee” that covers the costs of benefits they receive from union representation. This “fair-share fee” (union dues) covers the costs of the union’s activities – collecting bargaining, implementing and enforcing the contract including making sure people are paid the right amounts, representing employees at grievance hearings, etc. The Court decided that the “free speech” interests of those who object to paying for representation outweigh the right of the democratically elected majority that formed the union and the state to enter into a contract that requires home care workers to pay those costs in exchange for the services those costs bring to the employees. While this court decision does not (yet) strike down the right of public sector (and other) unions in general to collect dues for representing workers, Illinois’ and other states’ home health care workers will now receive all of the benefits of union representation without helping to pay the union’s costs for doing so. The Court did not nullify the contract that provides the benefits – under the ruling employees who do not pay the fee will continue to receive those benefits because the state and union are under a contract to provide them. This will, of course, impede efforts to organize and represent such workers elsewhere because of the cost of hiring organizers and representatives to administer the union and meet the unions’ contractual obligations to employees. It remains possible that in a later case the Court will overturn its prior precedent and forbid requiring public employees to contribute to union bargaining. But today it has refused to go that far. 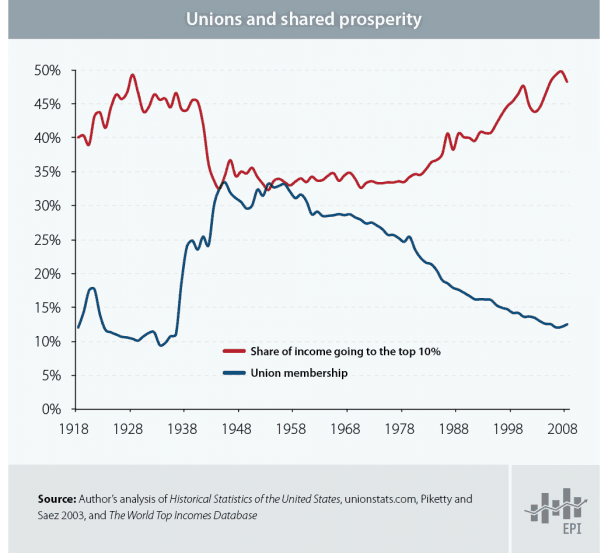 The unions have lost a tool to expand their reach. But they have dodged a major challenge to their very existence. The ruling places at risk a system of consumer-directed home care in Illinois that has proven successful in raising wages, providing affordable health care benefits, and increasing training. The number of elderly Americans will increase dramatically in the coming years. States need to build a stable, qualified workforce to meet the growing need for home care–and having a strong union for home care workers is the only approach that has proven effective. … The case was brought by the National Right to Work Legal Defense Foundation, an extreme anti-worker group whose funders include billionaires like Charles Koch and the Walton family. It is the latest in a decades-long attack on the rights of working people to join together to improve their jobs and the quality of services they provide. The National Right to Work Legal Defense Foundation (NRTWLDF) that brought this suit is the 501(c)(3) arm of the National Right to Work Committee (NRTWC), a 501(c)(4) organization. These are tax-exempt “charities” so the funders are legally secret but records of donations from groups funded by the Kochs, Walton and others show their funding. It is known that the groups’ President Mark Mix attended the 2010 Koch strategy summit.) A comprehensive article at PR Watch, Who Is Behind the National Right to Work Committee and its Anti-Union Crusade? tells the story. Media Matters: Tennessee Paper Pushes Koch-Connected Anti-Union Message Ahead Of UAW Vote. This case presents the question whether the First Amendment permits a State to compel personal care providers to subsidize speech on matters of public concern by a union that they do not wish to join or support. We hold that it does not, and we therefore reverse the judg­ement of the Court of Appeals. In other words, the court decided the benefits of democracy are not a sufficient justification to override what “speech” an individual wants to associate themselves with. While the individual can collect those benefits, the individual should not have to help pay the costs involved in getting those benefits. Enough is enough, the Supreme Court ruled today in Harris v. Quinn regarding the power of government to force public employees to associate with a labor union and pay for its speech. … Harris, despite its arguably narrow holding and apparent restraint, is thus part of a dangerous trend of veiling deregulatory economics in constitutional law. The Roberts court seems to be forgetting one of the principal lessons of constitutionalism since the New Deal: Economic policy should be made by legislatures, not courts. Harris is the Roberts court’s most recent retreat from that long-standing and wise consensus. It would do well to retreat no further. The purpose of the First Amendment, according to the plaintiffs in Harris, is not to foster democracy, it is to render democracy irrelevant. This is a radical rethinking of our Constitution. And it was just embraced by five justices of the Supreme Court of the United States.